Disclosure: This project has been compensated as part of a social shopper insights study for Elmer’s #gluenglitter #collectivebias #CBias. All thoughts and opinions are 100% honest and are that of my own. I had a great time working on this project! For my DIY project using Elmer’s Foam Board and Krazy Glue, I decided to create a Butterfly Costume for my daughter for Halloween. I really wish that the photos would have brought out more of the glitter. The wings are covered in a layer of glitter and just glisten when the light hits them. They are beautiful! Below is a tutorial for how to make your own Butterfly Costume. Please visit my Google + Album for some photos of my shopping trip. Step 1: Decide what shape you want to use for your butterfly. I used a template from the Family Fun website. 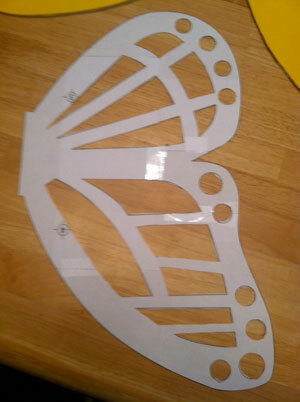 Following the template instructions, I taped it together to create a large butterfly wing. 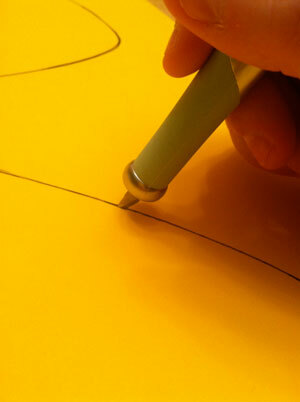 Step 2: Cut out the outside of your design and trace on the foam board. Flip design over and trace again to make 2 wings. 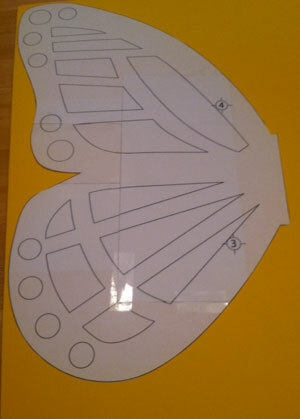 Step 3: Using your craft knife, place a mat underneath the foam board and cut out your butterfly wings. 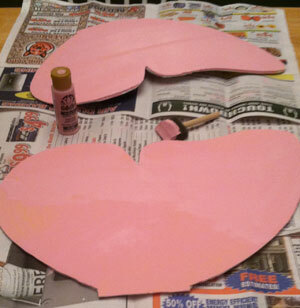 Step 4: Since the board I purchased was yellow, I then used my acrylic paint to paint the board pink. I used 2 coats of paint and let each coat dry in-between. 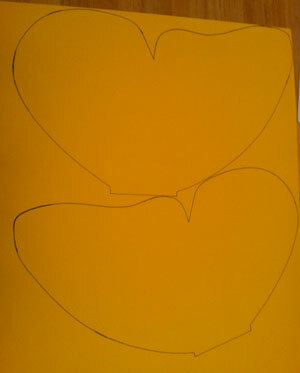 Step 5: Using my craft knife, I placed my template on the mat and cut out the inside parts of the template. 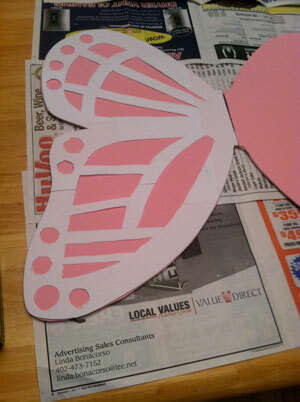 Step 6: Place the template back on the butterfly wing. 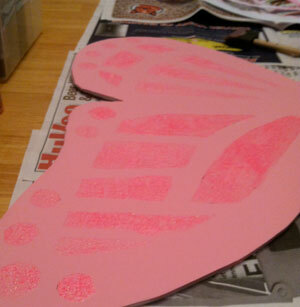 I then used a glitter based acrylic paint to paint the decoration on the wings. Here is the part where you can be extremely creative and paint your own designs on the wings! 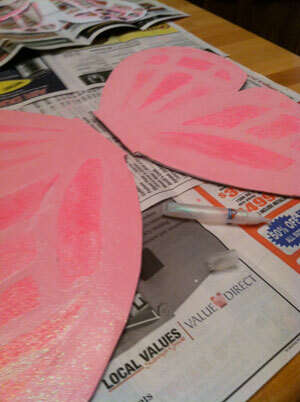 I also used Elmer’s Sparkle Glue to put a thin layer of glitter over the entire wing after my paint had time to dry. 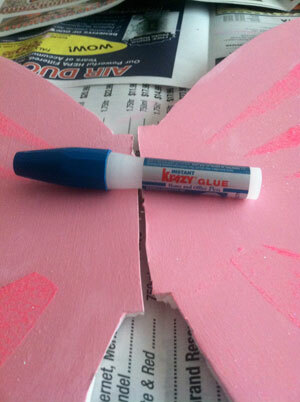 Step 7: Using the Krazy Glue, Glue the wings together. You might have to trim up the inside of the wings a bit to get them to fit together. I definitely had to trim mine, as you can see, they were very uneven! Step 8: Wrap ribbon around the outside of the wings to give them a finished look. I also wrapped ribbon around the center of the wings to over up any flaws in the attaching process. 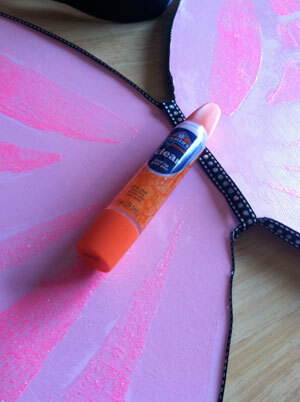 I used my Elmer’s Dual Tip Glue Pen and Hot Glue to glue the ribbon onto the wings. 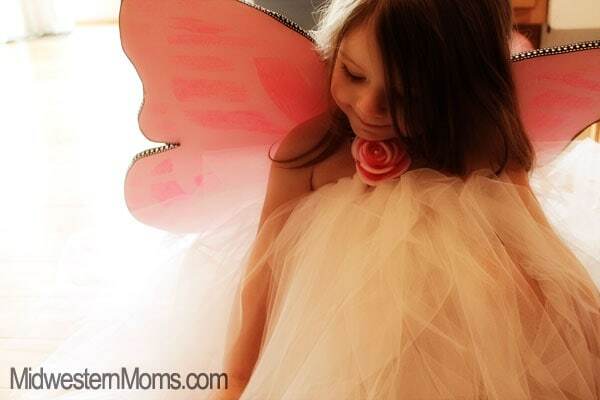 Step 1: Gather your supplies you will need for the tutu dress. Step 2: Measure your child’s body from their chest to their knee. 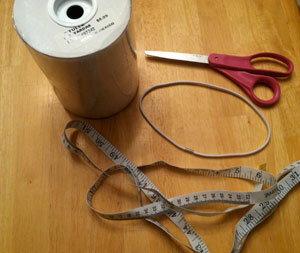 My daughter’s measurement was 21″ so I doubled this measurement and cut the tulle at 42″ long. I cut my tulle as I create the tutu so I didn’t have to cut any more strips than I needed. 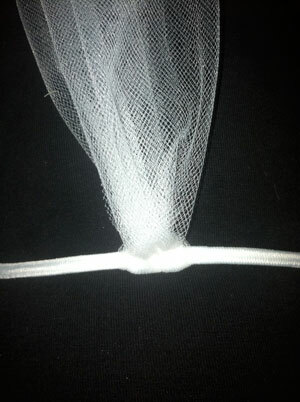 Step 3: I put the elastic hair band around my thigh and started to attach the tulle to it. 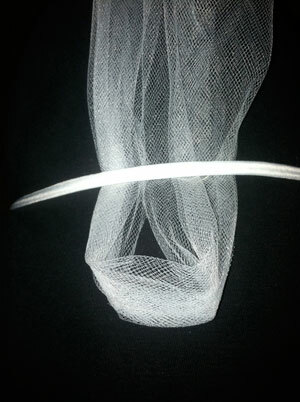 First, you want to double the tulle and loop underneath the elastic. Step 4: Then you will pull the ends through the loop and pull very tight against the elastic. Proceed with this until you get all the way around the band. I tend to stagger mine by looping both under and over for a fluffier tutu. 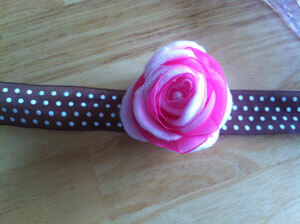 Step 5: Attach a flower to a long piece of ribbon using hot glue. The length of the ribbon will be determined by how long you need it to be to wrap around the tutu and your child’s neck. 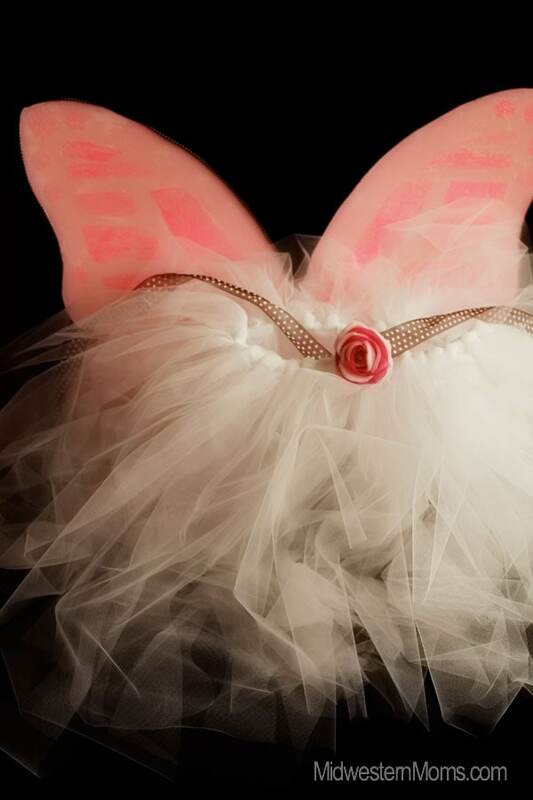 I also used this same ribbon to tie the wings on the back of the tutu. Here is the finished product on my daughter. I think it turned out absolutely gorgeous! I might be a bit biased though! What a beautiful costume! You did a fantastic job!! OMG… so cute. Makes me wish I had a little girl. That turned out great! What a beautiful butterfly! You’re not just biased, she and the costume are both definitely gorgeous!! Going to attempt this. My daughter(4) wants to be a butterfly. While i love the idea of crafting, it kinda scares me. So we will see if i can do it. Oh, i was wondering how you get the wings on her back… Arm loops… Idk. And i just left Michaels with the white foam board at $2.99 b1g1 free! So if i mess up i have a backup! Hi! Love this tutorial! Do you have a link for the butterfly template? Looks great! How did you attach the wings to her? Did you use that ribbon that wraps around the seam to tie it to her? Use the ribbon that was attached to them to tie around her.